A COLOSSUS of the clubbing world has bought a derelict bar under Camden Road train station. Billy Reilly, one of the masterminds behind King’s Cross nightclub scene who owned the Cross and Bagleys venues, bought the property once home to Bar Fink in Camden Road. Mr Reilly, who lives two streets away from the site, met around 40 residents in a nearby pub earlier this month to brief them on his plans. The club boss, whose previous nightspot drew celebrity DJs and trend-setting crowds, told the New Journal he was also moving his company’s head office to the building. Mr Reilly said he did not plan to submit any applications to the council for at least eight months because he was still listening to residents and had not made any decisions. But neighbours who attended the meeting said a 600-capacity club that would open until 4am had been suggested. They are fearful a new bar would increase anti-social behaviour such as urinating in the street, drug dealing and cab doors slamming. However his pledges to residents – which include smartening up the railway bridge above with foliage – has failed to dampen community concerns. Alasdair Hawkyard, a writer from Bonny Street, said: “When it was Fink, the consequences were awful – the noise was appalling, nightmarish even. 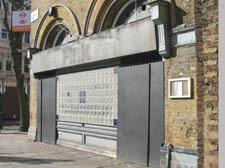 Camden Town ward councillor Pat Callaghan, who attended the meeting, warned there would be “mayhem” should the bar reopen. Mr Reilly’s flagship club, the Cross, closed to make way for the King’s Cross redevelopment. It shut its doors for the last time on New Year’s Day this year.